The Florida Gators softball program was in the national spotlight again Monday night. However, this time it was for the wrong reasons. The headlines across multiple sites told a story–an exaggerated, ugly and false tale. PER ESPN: Tim Walton of Florida Gators and Haley Fagan of Auburn Tigers get into postgame tussle. PER CBS NEWS: Auburn softball player, Florida coach clash after game. 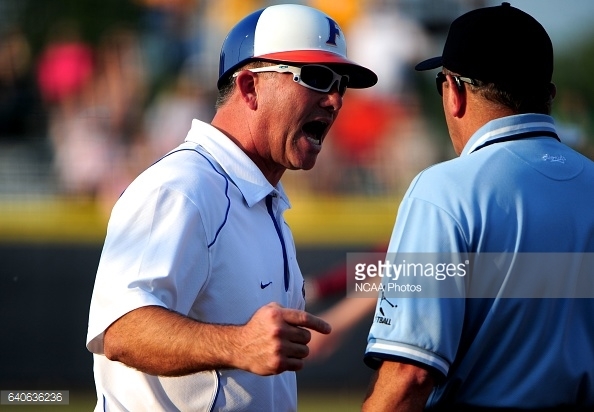 PER NY DAILY NEWS: Florida softball coach, Auburn player shove each other after game. PER LA TIMES: Auburn softball player goes after Florida coach following shove in handshake line. It would be a BIG deal if these headlines were true. However, despite indisputable evidence (there is video of the entire incident), Florida’s head coach Tim Walton was made out to be a horrible, woman-beating brute. Commentary read as if he spent his entire career at Florida beating up on females, including players and even his own wife. One problem was that, initially, the only view anyone had seen, showed the incident from an angle which appeared to show Walton hitting Fagan in the face. There was no video played to show what happened leading up to the incident. I debated whether I should even write a story about this because it happened AFTER the game, and ended rather quickly. Why did it end so fast? Because Walton was smart enough to remove himself from the situation. In softball, the head coach is typically on the field for quite a while after the game, talking to the players and media. This time however, Walton, was quick to leave the scene<–a true sign of maturity. What was Haley Fagan doing while Walton was leaving? She was being restrained by her teammates as she appeared ready to confront Florida players, who were obviously unhappy about what had just occurred. I was watching the late edition of SportsCenter, as I do most nights, and sure enough, towards the end of the broadcast, the unfortunate incident was mentioned. SportsCenter showed a longer clip than had been shown previously on the internet or on twitter. In SportsCenter’s clip, Fagan was clearly displayed going through the handshake line, high-fiving other members of the Florida team, until she got to Coach Walton. Walton is seen looking straight ahead, and seemed not to notice that Fagan had put her hand down. Walton’s hand then makes the usual gesture toward a high five, which accidentally lands softly on Fagan’s shoulder, all due to her unsportsmanlike behavior. Anyone with half a brain who saw this clip should come away knowing the Florida skipper had no intention of hitting Fagan. Florida and the Fagan family have a history. In 2012, just before the Gators faced FGCU in the opening game of the NCAA Regionals, Haley Fagan’s older sisters, Kasey and Sami, and one other teamate, were dismissed from the team. There remains a lot of uncertainty about what actually occurred, since nobody “in the know,” ever spoke to the specific reasons for their dismissal, but both sisters would transfer to other college programs. I stayed awake late last night, knowing that because this incident had reached SportsCenter, (as softball is rarely featured), it would be a national storyline. I continued updating twitter, searching Tim Walton’s name, and the results were disturbing. Some people questioned Walton’s morals as it pertains to “beating” women. Some Florida fans were even asked how they could support someone who would hit a woman over a sporting event. Another Twitter comment suggested it was no coincidence that Walton hit a girl whose family has ties to his program. While I agree it’s no coincidence that Haley Fagan was involved, as she instigated the whole thing, I ponder what the outcome would have been if she had behaved with class and dignity and kept her hand up, as is part of the tradition…. Tim Walton has been nothing less than a connsumate professional since coming to Florida, and the Gators are fortunate to have him as their coach. Walton’s players are often spotted around Gainesville participating in charity events, and he clearly possesses the morals necessary to lead today’s youth. Tim Walton showed us, by example, how one can do the “right” thing and still come out on top in the end, when we were rewarded with Florida’s first NCAA Championship just two years later. On Tuesday, Walton once again took the high road when he apologized for the attention this “fake” story took away from the series between two of the country’s top programs. Maybe when Haley grows up, she’ll look back on this incident with regret and realize she was responsible for stealing her own team’s win…..
Coach Walton, no apologies are needed. Actually, the entire Gator Nation should applaud you. Great article and well written. It is obvious that she had an ax to grind because of past issues with her family and coach Walton. She choose to make a scene after as coach Walton said after a good series. I think her frustration really came from her poor play and Auburn poor performance. Very sad. This article was well put. Coach Walton has my FULL support and I give him a standing Gator chomp for his morals.. 🐊. Coach Walton took the high road with this situation. Coach Walton had NO reason to hit her. But she thinks she did have a reason (which was wrong because her sisters deserved their consequence) to act that way. I hope all coaches learn from his cool head, morals, and knowing when to leave the situation.. I saw the game on Wednesday night. After the game noticed everyone SHAKING HANDS, class move, to make sure that does not happen again. Thank you for this artical. It needed to be said. And thank you Coach Walton for being you..
Great article & most definitely true in my opinion. In my 30+ years of coaching college fastpitch I found myself “high fiving air” when disgruntled opponents chose to ignore my congrats after games. Most interesting part is how the angry Auburn player was first in the handshake line! This placed her DIRECTLY behind Coach Walton when she returned her “high fives” to her team. I highly doubt a shove to Coach Walton would have occurred if she was found to be in the middle of this line & completely surrounded by her teammates. Premeditated maybe 🤔? She’s the infield captain, that’s why she’s first in line. I know what happend when the 3 girls were dismissed as my daughter was an Alabama player where the incident occurred. The Fagans have done a horrible job of rearing their children to be bullies. I’m not a fan of Walton but I place full blame on Fagan. She was in the wrong! Period! Walton is a class act, the Gator Nation is lucky to have him!!! This situation was an opportunity for the Auburn coaches and Haley’s parents to teach her lessons on sportsmanship and respect for authority. Unfortunately, more and more of today’s young athletes along with support from their parents exhibit horrible behavior and disrespect for coaches and officials! Coach Walton is a class act! She was in the wrong and should be dealt with by her coach —- Walton intentially pushed a female player! Where is all the feminist in Florida? If O were her coach she would be benched a game and issue an apology. And if i were her coach I would have decked Walton! Who thinks it’s ok to hit a female??????? I guess I have only half a brain…which doesn’t speak to well of Florida for allowing me to graduate. What accidental push, touch, missed high -five has a follow through? Haley, who was first in line for the hand shake, didn’t high five Coach Walton earlier in the series , meaning he knew she wasn’t going to high five him after game three either . Add that to family history and the fact that Auburn just ended our 21 game win streak, and its obvious this was a deliberate and petty move on his behalf. Lol “anyone with any kind of brain” that has ever played a sport before has experienced someone not high-fiving in line. Not once in my ENTIRE career has that led to someone being shoved in the shoulder. Anyone saying that he “didn’t shove her on purpose” is blind. If Coach Walton really was the “bigger person” everyone is talking him up to be, he wouldn’t have done it in the first place. How childish of him. I think that she has a right to not want to high five this man and she should not have been looked down upon for that. You can tell in his expression when she shoved him back that he did it on purpose.. no discussion. If that would have happened to me I would have been just as upset as she was.. I wouldn’t necessarily call it a ‘shove’ and I know that wasn’t you’re choice of word, but have to agree that this was absolute childishness on his part. You make a great point too about his response to her retaliatory push in the back; he sure was quick to react to it, wasn’t he? Like he was expecting it. According to Kevin Fagan, Haley never high fives Walton, btw. Whole Fagan group look spoiled to me. No class. To me, Kevin Fagan’s admission Haley won’t high five Florida coaches about sums up the at fault party. That admission , is pretty sad. Grow up Fagans. Right, because if a player refuses to shake hands, the opposing coach should push her…makes perfect sense.